Obedience is an important concept for children to learn and understand. Using the Bible to teach children about obedience can play an important role not only in dealing with God, but with the authority figures in our lives. These Bible puzzles, codes and mazes about obedience developed from Children's Worship Bulletins can help you teach this lesson. By using pictures, mazes, codes and more we make learning about obedience fun and exciting. When children are having fun while learning they tend to retain the information better. All of our bulletins are reviewed by our education specialist to make sure your students will get the most out of them. Activities in the bulletin are age appropriate and tested by children. 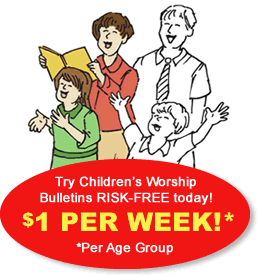 Check out this example of making your own activity using a bulletin from Children's Worship Bulletins about the importance of obedience. We will show you in this example how to use the bulletin in a classroom setting. Print out a copy of the bulletin for each student. Print out the key with the answers. Make two enlargements of the puzzle to use as posters. Get mounting putty to hang the posters with on your wall or board. Divide the class into two relay teams. Give each student a copy of the puzzle and a pencil. Post your posters on the wall. Give instructions to the students, "In each set determine the pattern for the letters. Write the letter that completes the pattern on your paper. When I say go, the first person on your team will run across the room, add the first letter to the poster and run back. The second person will then run across the room, mark the second letter and run back. We will continue until the puzzle is completed. The first team to finish is the winner." Yell 'GO!' when ready to begin. Read the answers for everyone. Reinforce your lesson by talking about obedience. Ask the class what the game would be like if one student decided to not play by the rules. What could happen? Explain that obedience makes life better for us and those around us. Our bulletins include activities for two age groups, 3-6 year olds and 7-12 year olds. With hundreds of bulletins to select from, you will never run out of ideas for your Sunday school classes. There are many Bible stories that could be used to explain obedience. Also, you will find many bulletins that apply to that topic. Our library is fully searchable by keyword, topic or Scripture. All of our bulletins are based on the Bible including the Old Testament, the Gospels and the Epistles. We help you keep your students engaged and excited about learning about the Bible. You are free to download as many bulletins as you would like.